I once heard an old hockey coach give his thoughts when asked in a preseason camp “how do you know if he will play in the NHL”. He simply replied “you know it when you see it”. Needless to say in baseball today, all we hear about are prospect metics such as “launch angles” and exit velocity” or “can he throw 95 mph”. I’ll take the old scout who “knows it when he sees it” when when scouting a major league prospect. When I went to the Phillies-Orioles Instructs game on Saturday morning I went hunting for guys I thought would some day play in the major leagues. I found some. I am going to say that third baseman Alec Bohm, shortstop Luis Garcia, right fielder Carlos De La Cruz and closer Austin Ross will someday play in the Show. They all showed major league skills sets in the game. The Phillies No. 1 2018 draft pick, Bohm has impressed us every game we have seen him play in Florida. Yesterday, he lined a rbi single to center to score Garcia for the first Phillies run. Watch HERE. 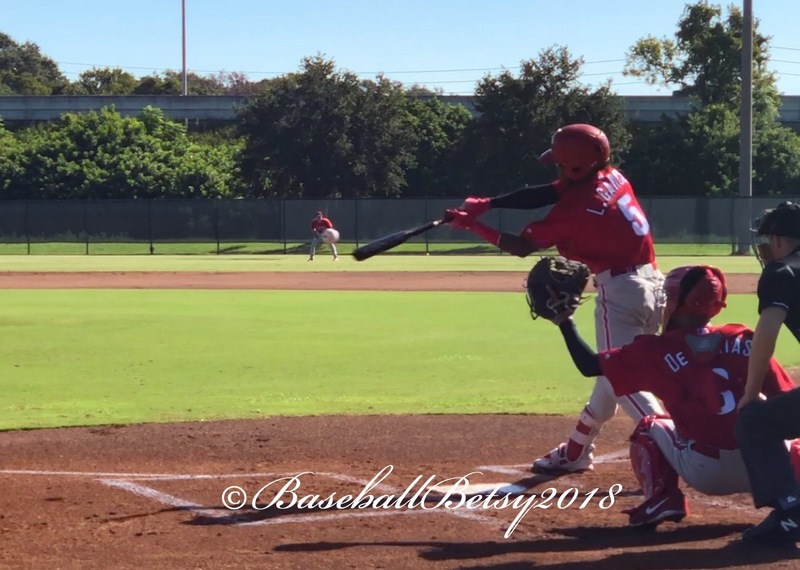 Garcia just turned 18-years-old on October 1st and was the top Phillies international signing in 2017 and 2018 GCL All-Star shortstop. Watch him bat HERE. He beats a throw to first and eventually scored on Bohm’s base hit. De La Cruz continues to impress us as a five-tool player. He just turned 19-years-old on October 6th. Yesterday, he threw out a tagging runner at the plate for a 9-2 double play. He then singled, stole second and scored on an infield out in his next at bat. Watch his single HERE. The New York City area native went undrafted in 2017 and was signed as a free agent that August. 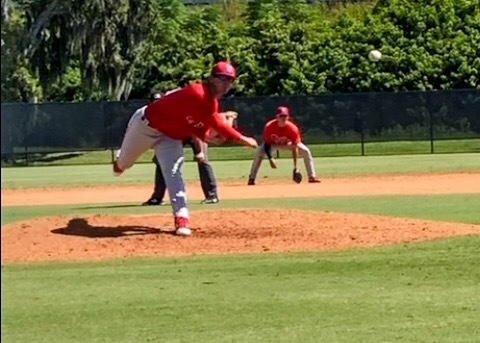 The surprise yesterday was the work in the ninth inning by pitcher Austin Ross who was a Phillies 35th round draft pick back in June. Ross had shoulder surgery in 2017 and did not pitch. The Phillies took a chance on him late in the 2018 draft. He struck out two in his one inning of work. His pitches he threw were at the knees, on the corners and in the mid 90’s. Watch one of his strikeouts HERE. Read more about him HERE. 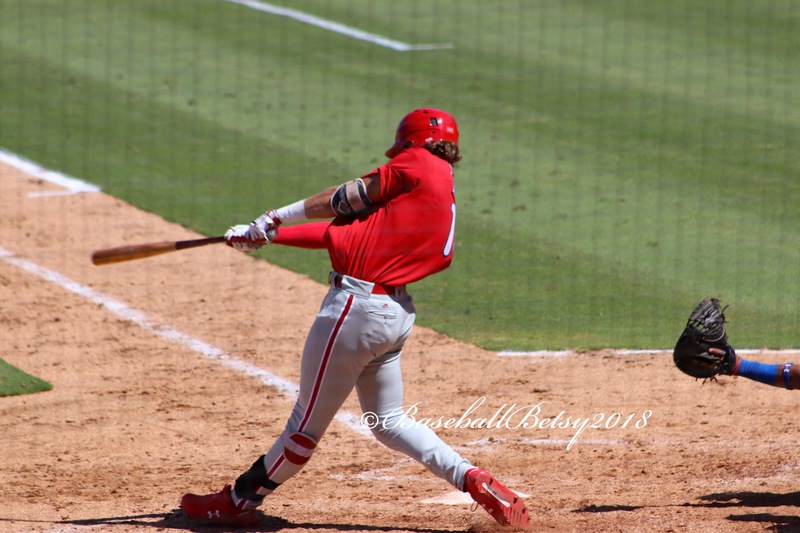 The Phillies are finding major-league talent at the top and bottom of the 2018 Draft and North American and International free agents as we saw in Saturday’s Instructs game. In our next blog we will write about several more Phillies Instructs who impressed us in Saturday’s game. The Phillies charged out to a 4-0 lead after 6.2 inning before an Orioles home run. The Orioles tied it with three runs in the eight inning. The game ended 4-4 after nine innings. The Instruct season comes to an end next week after home games against the Yankees on Tuesday an Friday. 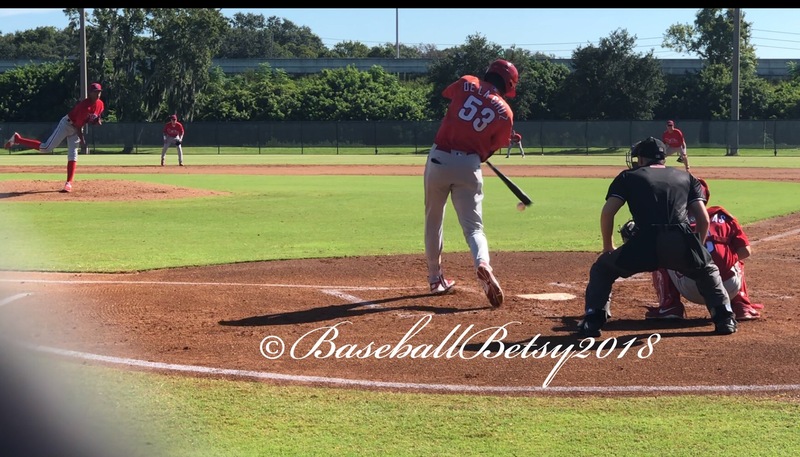 This entry was posted in 2018, Fall Instructional League, September and tagged 2018 Phillies Florida Instructs, Alec Bohm, Austin Ross, Baseball Betsy, Carlos De La Cruz, Luis Garcia, Philadelphia Phillies. Bookmark the permalink.